In Left Elsewhere, volume editor and lead essayist Elizabeth Catte turns a skeptical eye toward "purple" politicians, such as West Virginia Democrat Richard Ojeda, who are hailed by many as the best hope for U.S. progressives outside the urban coasts. 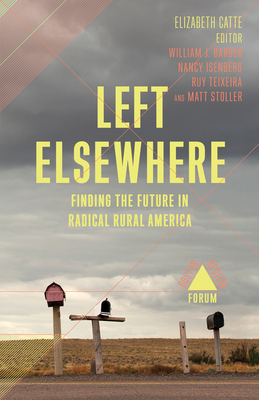 By offering a survey of what the left actually looks like outside major urban centers, Catte shows how an emerging rural left is developing new strategies that do not easily fit into typical ideas of liberals, leftists, and Democratic politics. From environmentalists who successfully block pipeline construction to advocates for "radical" health care solutions such as needle exchanges to school teachers who go on strike, these newly energized activists may offer a better path forward for both policy and candidates to represent the needs of poor and working Americans. By engaging activists and scholars outside the coastal bubbles, this collection offers insights into several overlooked areas, including working-class women's activism, victories in new labor struggle (especially in staunchly right-to-work states) and new organizing principles in Jackson, Mississippi--"America's most radical city"--that are bringing about meaningful racial and economic change on the ground. Taken together, the essays in Left Elsewhere show that today's political language is insufficient to convey what's happening in these areas and examine what, if any, coherent set of politics can be assigned to them.